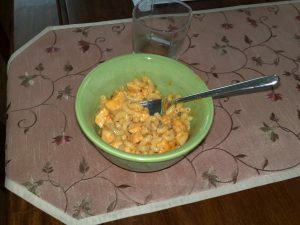 Left alone for dinner tonight, I decided to do some sort of macaroni and cheese with chicken dish, but the end result was not like the healthy-recipe at all. 1a.) I guess that means I’m never going to the Domino Effect Lounge ever again. 1b.) I’m definitely never working there. 2.) I’m taking a sabbatical from commenting/talking about New Orleans crime for a while. I’ve nothing to say. When it gets to the point when you’re totally numb to about 50% of the police incident reports and the other 50% just make you laugh, well…I don’t know what to say. Thank goodness. I went to Kjean to pick some up last week, and for some reason, they had none. So I did the next best thing and decided to adventure. I decided to go to Zimmer’s Seafood since I grew up near there and I hadn’t checked them out post-K, but halfway there, I passed a place called Broadview Seafood. I u-turned and went in and bought some crawfish, went home, and they tasted ok, but these things were tiny. I can’t remember ever having such small bugs before. So here’s to hoping the summer brings things back to normal. That’s all till next time. I’m sure I’ll have something crime-related to say, because I am not good at sabbaticals.